Does your barn do a night check? What does it consist of? 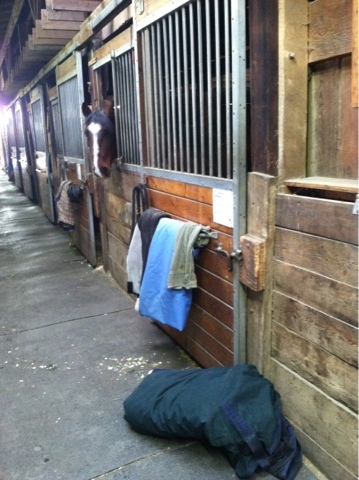 I’ve always felt most comfortable keeping Tristan at a boarding barn that does night check. I think it’s a good double-check, and a good way to help keep barn management flowing smoothly. It makes me feel more comfortable, as a nervous horse owner. Last Friday night, I did night check, since one of the regular barn workers was visiting with the trainer in Florida. (And posting photos of kayaking in t-shirts on Facebook, sob.) I hadn’t done it in nearly a year, so the barn manager left me a list of what the current night check routine is. Holy mackerel, guys. Here was my night check. 9:05 pm – Duck into tack room, let cat out, check the list. 9:06 pm – Put on lined rubber gloves and start soaking hay for the two recent colic cases. Tear the hay up into tiny shreds, flip over and over and over again to make sure water penetrates every possible nook and cranny. 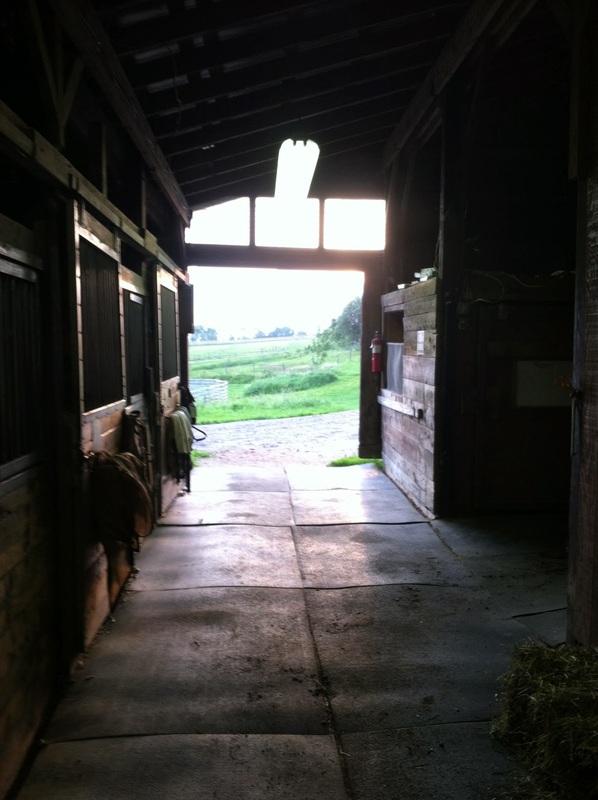 9:15 pm – Start haying remaining horses in the barn. Everyone gets two flakes, except for a few who get three, and the yearling, who gets one. 2/3 of the horses in the barn have Nibble Nets right now. All of the Nibble Nets are double-clasped and those clasps are tied together with baling twine. The first stall takes me a solid 7 minutes and I swear, out loud, repeatedly. You haven’t known frustration until you’ve tried to stuff two flakes of hay into a Nibble Net hung at head-height, while undoing the tiny clasps with thick winter chore gloves, while a deeply impatient horse is dancing back and forth, snatching pieces of hay that are escaping your arms. 10:07 pm – Finish haying (YES, REALLY), and do blankets. Every horse that had a neck cover got that neck cover that cover pulled up and buckled down. One horse was wearing a cooler from being worked earlier in the evening; I pulled that and put on the two blankets in the aisle. Probably about 1/3 of the horses had some layer that needed to be added. 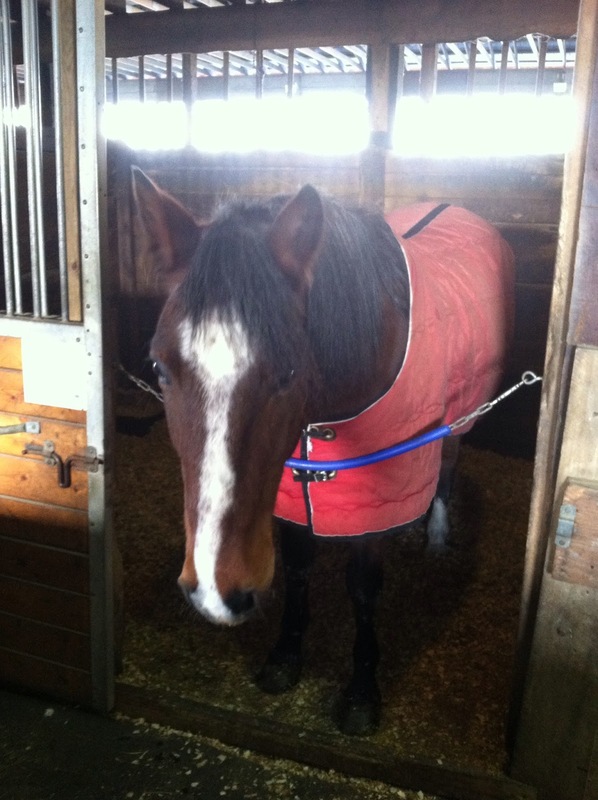 I also took that time to look hard at all the other blanketed horses, and fixed two leg straps that had come undone. Fortunately, I was warmed up enough from haying that I could take my gloves off to do the straps. 10:23 pm – Toss grain to the horses who either got a snack at night check, or whose evening grain had waited until night check because they had been worked right around dinner time. Add water to all the grain. 10:30 pm – Start water. Oh, winter water. My nemesis. I had two options: hose or buckets. Using the buckets would take longer, be harder work, and involve more walking back and forth. Using the hose would guarantee that I would screw up the draining, hanging, and putting away, especially with the barn manager’s warning that the hose would freeze very, very quickly once I stopped using it. Buckets, then! 11:07 pm – Water done. On the one hand: I am now twice as cold, have ice rimmed all over my jacket, and pulled something in my elbow hauling water to 25 horses. On the other hand: is there anything quite as satisfying as using a sledgehammer to smash out ice from buckets? 11:08 pm – Quick double-check of the list the barn manager left for me. Check everything off. Do one last walk up and down the aisles, checking doors, latches, and lights. Everyone looks happy, and the mare who earlier was a bit unexcited about her hay is going at it with gusto now. Good. Tristan, who got extra hay scrids and a sip from every water bucket as I went by, doesn’t really want to see me go, and shoves me all over the place with his nose while I close up his stall door, which I had left open with a stall guard up. 11:15 pm – Put the cat back in the tack room, over his loud protests. It’s 14 degrees and predicted to hit 1 degree by about 3 am, so I don’t feel right leaving him out. Make sure the space heater is on and near the water line and not touching anything. Make sure the frost-free hydrant outside is not dripping, or the dripping water will freeze right back up into the water line, no matter how well-insulated. 11:16 pm – Get into my car, blast the heat, and sit for a moment checking off the list in my head. Decide I’m done, drive away. 11:17 pm – Turn around because I have no specific memory of tucking the draft blockers underneath the front door. I hadn’t really disturbed them when I entered, but the barn gets unbelievable wind coming up the valley and hitting the hill, so this is actually an important piece. I double-check: yup, they’re in place. 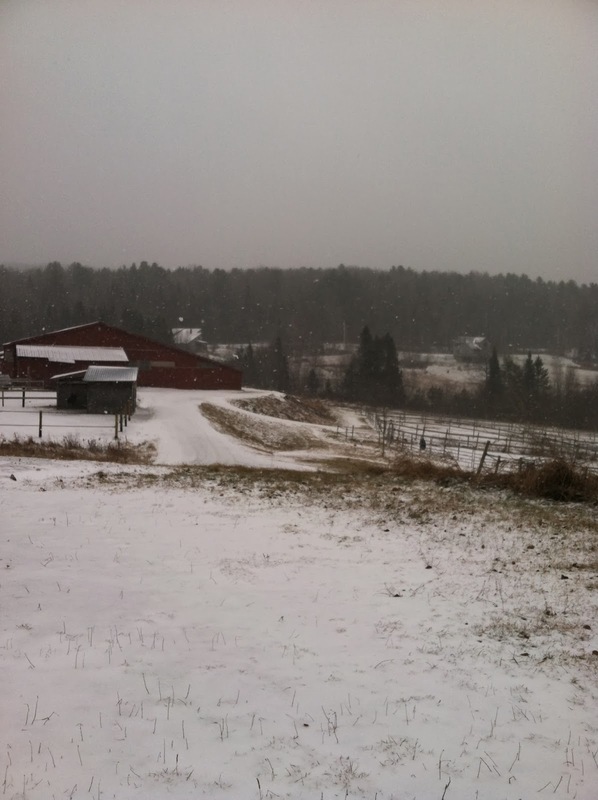 Barn in winter, earlier this season. We have way more snow now. 11:18 pm – Back on the road again. 11:43 pm – Home. Bed. I’m too keyed up from what amounted to two hours of constant physical labor to sleep, so I read for about 15 minutes until the adrenaline passes and then I am out.cold. So yeah. Our night check routine is pretty intense right now. In the summer it’s just to put eyes on everyone, toss grain and sometimes a little hay, and make sure all the lights are turned off. Next Post Do you have a horse emergency fund? Holy crap that's an intensive night check! My barn doesn't do night check, although I wish they would. Night check should not take 2 hours! LOL That's just crazy! I do my own night check, feed grain, hay, top up water, put blankets on, and pick stalls. That night check is for real! Our barn is a bit smaller than yours, it sounds like, and lots of horses are on night turnout, so our barn manager (or whoever is babysitting, sometimes me) does a night check-esque routine between 7 and 9 PM. Dinner (hay) is around 5, so usually everyone is finishing up or all done, and ponies are either blanketed, turned out, or grained/medicated/what have you as necessary. I have to say, the first time I did this I was absolutely, completely, and utterly terrified that I would miss a colic sign or something and there would be a dead horse in the morning, but I was just fine. wow – definitely a lot of work! we don't have a night check per se – just dinner time. and a lot of the chores (like hay and water) are done with the morning feeding and chores. our horses live outside all day long, and all night too unless it's really cold and/or wet outside, so the work can be spread through out the day. plus the BM lives on site just in case..
Holy cow! Our night check doesn't involve any blanket changes or dressing–just throwing extra hay and checking water. In the summer, BO unplugs all the fans for the night because she's super paranoid about an electrical fire. Wow, that's a *really* involved night check! But I think night check is really important and am glad when people take as much care as you did!